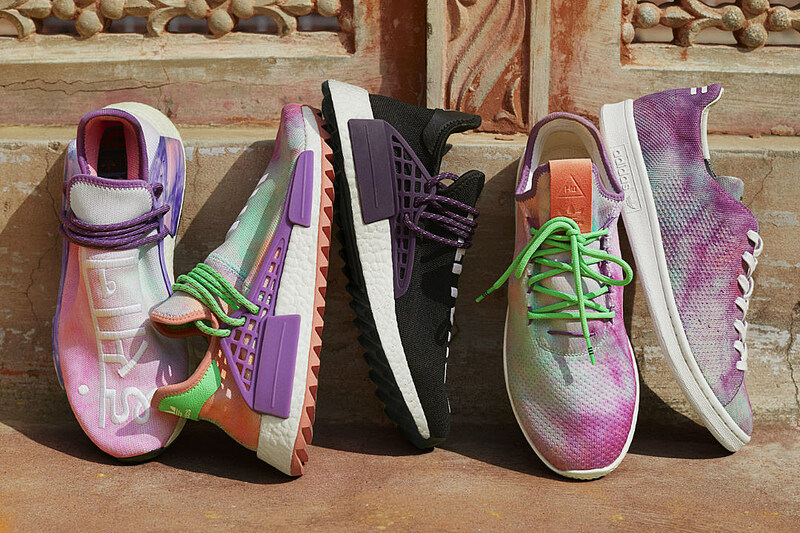 For the final chapter of Pharrell’s Adidas Holi Festival collection, the Three Stripes and the “Happy” artist will release a Powder Dye collection, highlighting the Indian celebration known as the festival of colors. The resulting apparel leverages a breakthrough technique to create one-of-a-kind pieces that are powder-dyed in a swirl of pastel tones. In footwear, the iconic Adidas Originals by Pharrell Hu NMD returns in three iterations: one a classic black coloration with sublimated powder dye effect on the inside collar and two with the sublimated uppers to take on the powder dyed aesthetic, all complemented with reflective laces and two powder-dyed iterations of the PW Human Race, with contrast-color lining and a marbleized effect on its stabilizer. The sleek Tennis Hu PD pairs its color-crazy sublimated print uppers with a crisp white leather lining, while the collection’s update to the Stan Smith PD finds the Adidas icon coated in an explosion of bright purples and blues. The Adidas Powder Dye collection will pre-release on March 2 followed by a general release on March 16.